All financial transactions of a company code are recorded on a daily basis, hence it is required to have various SAP FI documents to capture financial information about transactions. Each of the documents has a common structure. Also, each document is given an ID from a specific number range that is defined by SAP FI document type of this document. It helps stakeholders and auditors to perform different checks and reviews. In SAP, each document will be identified based upon document number, company code and fiscal year. All financial documents in SAP have similar SAP FI document structure that consists of a header and line items information. A document header consists of fields like posting date, document date, entry date, fiscal year, user id, etc. Document line items consist of fields like G/L account, cost objects, document and local currency, etc. A document can have up to 999 line items. A document has two control keys: one is the header data and another in the line items data. An example of an accounting document illustrating SAP FI document structure is shown on the picture below. The headers of SAP FI documents contain the following fields. Document number (BKPF-BELNR): A unique identification of a business transaction posted in the company code. Number ranges are defined at company code level. Company code (BKPF-BUKRS): A business transaction posted in the organization. Fiscal year (BKPF-GJHAR): Accounting year in which business transaction posted. Document date (BKPF-BLDAT): Invoice date of the invoice or transaction. Posting date (BKPF-BUDAT): Posting date in which it updates financial statements of an organization. Period (BKPF-MONAT): Fiscal period which is derived based upon the fiscal year variant assigned to the company code. Reference key (BKPF-AWKEY): The combination of object key and object type updated in reference key. For example, goods receipt (transaction code MIGO) posted so system update MM document number as reference key. Fields like local currency, exchange rate, date of entry, user name, etc. are also available at the document header level. Document type is maintained in the header of SAP FI documents. Using SAP FI document types, it is possible to customize account type’s restriction, maintain number ranges, authorization groups, required fields at the document header level, exchange rate type, etc. 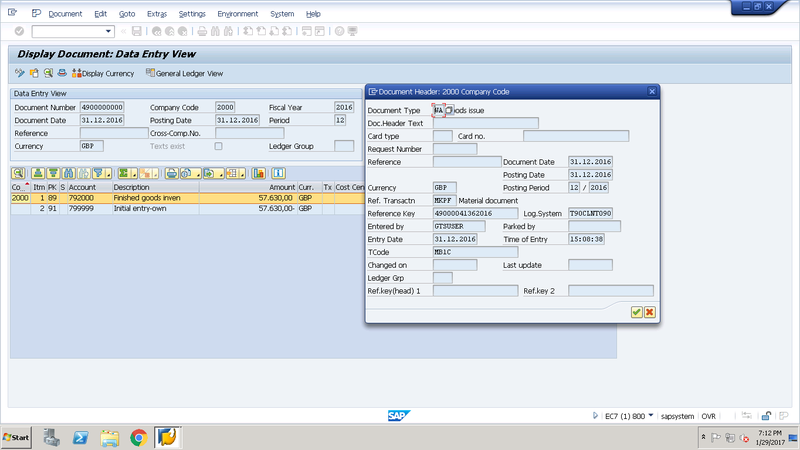 Without specifying a document type, it is not possible to input or post the transaction in SAP. To define a new document type, you need to navigate to the following path in SPRO transaction. Company code (BSEG-BUKRS): The company code in document header and line item will be same, in case of cross company code transaction one more company code also available at line item level. Posting key (BSEG-BSHCL): Posting key indicates whether the account is debit or credit. Special G/L indicator (BSEG-UMSKZ): To book vendor or customer advance payments/receipts special gl indicator used. Account (BSEG-HKONT): Account can be gl account/vendor/customer, based upon the posting key account will be considered by the system. Amount (BSEG-DMBTR): Local currency of a document. Fields like cost center, business area, order, assignment, etc. are also available at the document line item level. 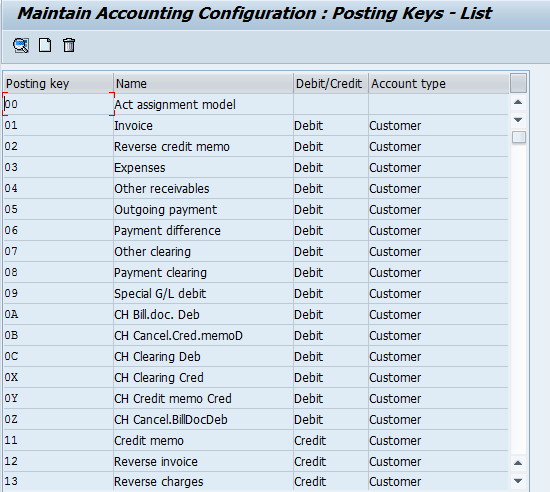 You define new posting keys in SPRO transaction by navigating to the following path. SAP delivered standard SAP FI document types and posting keys. It is also possible to define new document types and posting keys as per the requirement of client. A new document type number range needs to be maintained at the company code level to post financial transactions. For posting keys, there is nothing to be maintained at the company code level. Field status groups maintained in G/L account master data (company code level) must be in sync with the configuration maintained at the document type and posting key levels.